A recent paper by the Higher Eduction Policy Institute found that 45% of pupils at selective schools come from households with below median income, which suggests a very ‘fair intake’ across the social class spectrum. 45% of pupils selected to grammar schools come from the poorest 50% of households, which suggests that children from the poorest 50% of households have a near equal chance of being selected to a grammar school compared to the wealthiest 50%. The chances of being selected aren’t quite equal, but once you factor in all of the ‘objective’ material deprivation related barriers to education which children from low income households face, then this seems to suggest that grammar schools are doing a pretty good job of providing equality of educational opportunity where household income is concerned. It’s more common to look at selection in relation to Free School Meal (FSM) households, which represent the bottom 15% of households by income. By this measure, only 3% of pupils on Free School Meals get into grammar schools. 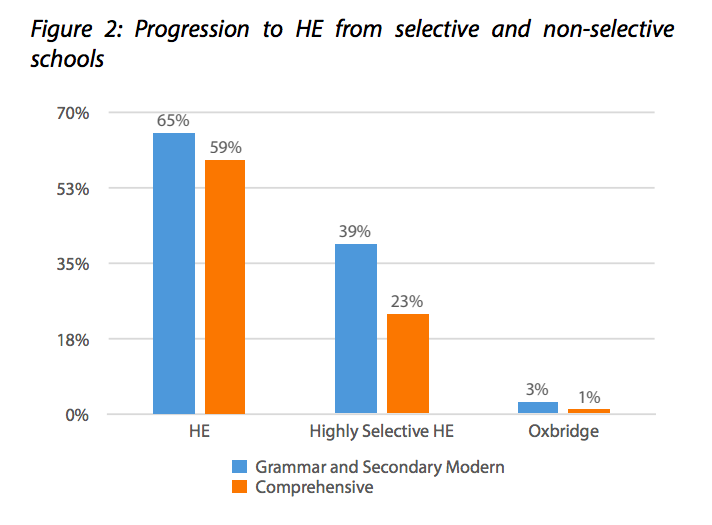 The report also looked at the chances of grammar school educated children getting into highly selective universities (defined as the top 1/3rd by academic performance, not the ‘Russel Group’) compared to children in non-selective (or just regular comprehensive) schools. 3% of selectively educated pupils get into Oxford or Cambridge compared to only 1% from regular state schools. a state school pupil with a BME background is more than five times as likely to progress to Oxbridge if they live in a selective area rather than a non-selective area. The report also looked at other things and made some policy recommendations. Check it out at the link above! NB – the stats immediately above are NOT looking at how well the bottom 50% of students by household income do, they are looking at all students from state and grammar schools. The study makes something of a leap of faith and assumes that ‘because 45% of students at grammar schools are from the poorest 50% of households then these have exactly the same chance of getting into a good university as students from the top 50% of households’. This may not be the case if we isolate out the bottom two quintiles. Interestingly the report says the DFE were not prepared to release this data! This is obviously of relevance to the education aspect of the syllabus, but also research methods (handily they’re combined in paper 1!). This is one of the very few pieces of supporting evidence for the view that selective education promotes equality of opportunity and social mobility. As such it is evidence against the Marxist perspective on education and against cultural capital theory. Also, if it is only grammar schools (rather than comprehensive schools) that are doing this, then it is a good argument for expanding selective education as the Tories want to do. It’s also an important illustration of how measuring a concept differently gives you different results – if looked at by Free School Meals, it looks like grammar schools are not providing equality of educational opportunity, but if you use wider income categories and compare the bottom 50% with the top 50% then they appear to be doing so. And if you look at how well the poorest 40% do (rather than the poorest 15% on FSM), they also allow for social mobility. NB – this would be a great analysis point in any sociology essay on this topic.